It’s actually not a bad question. After all you can use your home’s wiring to get networking from place to place, which is a pretty neat feat. And yes, home wiring is made of copper which is one of the better materials for an antenna. So it should work, right? Using your home’s wiring as an antenna just plain doesn’t work. There are several reasons. 1. How could that be safe? So let’s say that somehow you connected the antenna connector from your TV straight to an outlet. In a well-maintained system, this would probably trip a breaker. In a worst’case scenario, the TV itself would start to fry. A typical outlet is capable of sending 1.2kilowatts up a line. A typical antenna signal is about -40dBm which corresponds to .00001 milliwatt. In other words, the current going through that line is roughly one BILLION times stronger than it’s expecting. No way that’s safe. But let’s say there was some sort of adapter or something that pulled out the signal and lowered the current to something reasonable. It still might not be safe. 2. It probably wouldn’t work even in a perfect scenario. The sheer about of current going through the electrical system would overwhelm the very weak antenna signals. This is especially true since antenna TV actually does work in the 60Hz range which is what electricity uses. The power lines actually doing their jobs would block the signals that needed to get through. 3. And home wiring is not a perfect scenario. 4. It’s probably the wrong shape and size. If you stick a chunk of copper up on your roof and attach a cable to it, you’ll probably get some sort of TV reception. But really, what you’ll get is very minimal compared to what you get with a properly shaped antenna. In order for an antenna to work properly, its length should be an even multiple or fraction of the wavelength of the signal it’s receiving. In other words, to receive channel 7, which has a wavelength of about 6 feet, you need an antenna that is 1.5, 3, 6, or 12 feet wide when looked at from the direction the signal’s coming through. The wiring in your house certainly doesn’t qualify there. The odds that your home’s wiring is the right size to get good antenna signals are really, really long. So why does it work for networking then? Powerline networking uses a characteristic of signal transmission called “the skin effect” which allows for signal variations on the outside of the copper wire without affecting the voltage on the inside of the wire. Powerline networking creates little voltage surges and dips, not enough to cause a problem but enough to creep along the outside of the wire and be detected elsewhere. It works because it’s a closed system. There’s an adapter on each side and they talk to each other. An antenna system wouldn’t work like that. Theoretically you could use your powerlines in a similar way to get an antenna signal from one part of your house to another but for some reason no one’s built that. 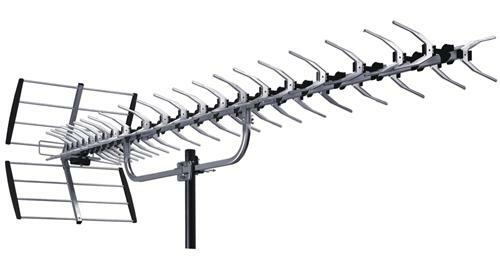 For the best antennas and networking products, check out the great selection at solidsignal.com!